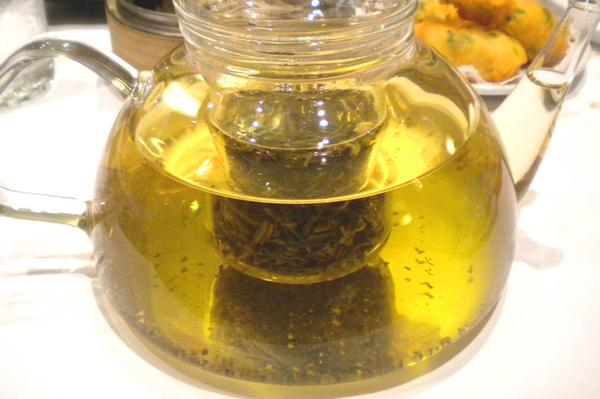 This is the jasmine green tea that the friendly, efficient people at San Francisco's Yank Sing served with the delicious dim sum we devoured — I mean, uh, enjoyed — there. The beautiful teapot's internal glass filter was even removable, so that we could remove the wet tea leaves from the infusion and prevent oversteeping between pots of tea. I am usually not partial to jasmine green tea, but between the lovely presentation and the absolutely delectable dim sum, I had no complaints at all.
. . . even though I was too busy devou— eating dim sum to complain anyway.